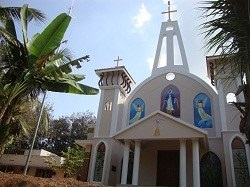 Immaculate Conception Church at Thannimood is one of the parishes of the diocese of Neyyatinkara. The Congregation of the Mission took over the parish in the year 2004 and appointed Fr.George Machukuzhiyil CM, as the first parish priest. The parish has two substations. They are St. Antony's Church at Narikkal and St. Theresa of Child Jesus Church at Poovathur. Pious associations like Legion of Mary, Little Way Association, Society of St.Vincent De Paul, Youth Association and Association of Miraculous Medal are very active and working very effectively in the parish.